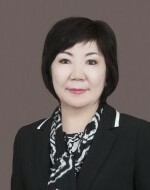 After graduating with honours from the Moscow Geological Prospecting Institute in 1979 Saule Urazayeva works in the system of geology and subsoil use of Kazakhstan. She has many years of continuous experience in the industry, both in the structures of state bodies and national companies, and in service exploration organizations. Since 2015, she is the Executive Director of the Kazakhstani Association for Public Reporting of Exploration Results, Mineral Resources and Mineral Reserves and a member of the International Committee CRIRSCO.